Here are a few images of the newly designed rear suspension. The first photo show the old suspension, which I've posted on before both here and on the Vehicle Build page. The second is the updated suspension, which you will see is a more complete and accurate representation of what is actually going to be used in the Rally Fighter, whereas the previous version was a "quick" mock up. 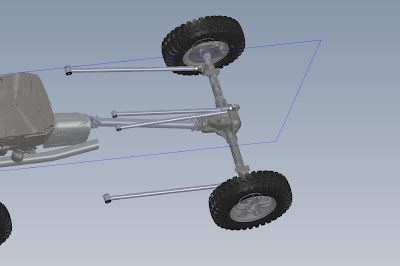 After taking a look at the images, you can see that the new suspension has control arms complete with poly bushings, functional rod ends, and the rear end is the actual rear end complete with rotors, disc brakes etc. versus the previous rear axle which was just a tube with a mock up center section. You can also see that we will have a much stronger triangulated upper arm. Less Time at the "Pump"